It’s time for Bake Along again! After a little break during Christmas period, Lena (Her Frozen Wings), Joyce from (Kitchen Flavours) and Zoe from (Bake for Happy Kids) decided to bake this really interesting cake – Cold Oven Cream Cheese Pound Cake. Just as its name suggests, this cake is baked in a oven that does not require pre-heating. Though it’s supposed to save the “hassle” of preheating the oven, I was so used to the notion of preheating the oven that there were several times my hand would involuntarily reach for the oven timer while mixing the batter – then I would remember that there’s no preheating required at all! Did any bakers experienced the same preheat-the-oven-syndrome as me? Anyways, I made a few changes by baking only 1/3 of the recipe, cutting down the sugar and also introduced chocolate into some of the batter. 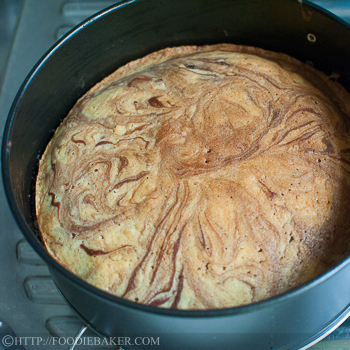 I wanted to create a marble cake but the marbling wasn’t as obvious as I had wanted it to be – probably because I used a tin that is a little too large. I guess I would try baking the cake the next time in a 6-inch tin for the amount I’m baking. I liked this cake because it has a really moist and soft texture (though a little too crumbly) with a nice buttery fragrance. And it is a great idea to use up my leftover cream cheese at home if I don’t feel like baking cheesecakes! I wonder how are other foodies’ bakes? 1) Combine a little cocoa and hot water to form a paste. Set it aside to cool. 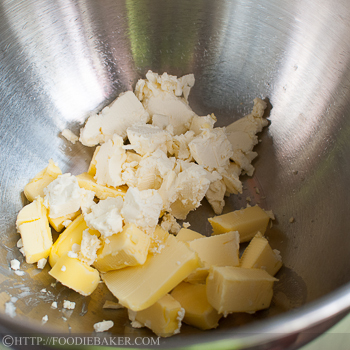 2) Combine butter and cream cheese in a bowl and beat until creamy. Room temperature butter and cream cheese are easier to cream, so take them out of the refrigerator 30 minutes before using. 3) Add in sugar gradually and beat until light and fluffy. 4) Beat in one egg. 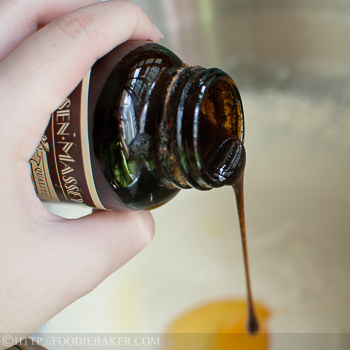 5) Add in the second egg and some vanilla extract. 6) Sift in flour mixture and fold it in. Again, the recipe uses an ingredient which I never have at home – cake flour. I always used this formula to substitute for cake flour (I found the formula online): 1/4 cup of corn flour / corn starch + 3/4 cup of plain flour = 1 cup of cake flour. 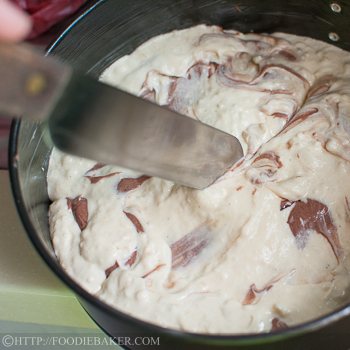 7) Mix 1/3 of the batter with the cooled chocolate paste. 8) Create a marbling effect with a knife / skewer. 10) Fresh from the oven! I’m submitting this to Bake Along hosted by Lena from Her Frozen Wings, Joyce from The Cooking Gallery/Kitchen Flavours and Zoe from Bake for Happy Kids. Grease a 6-inch round baking tin. Line the bottom with parchment paper. Set aside. Combine corn flour, plain flour and baking powder in a small bowl. Set aside. 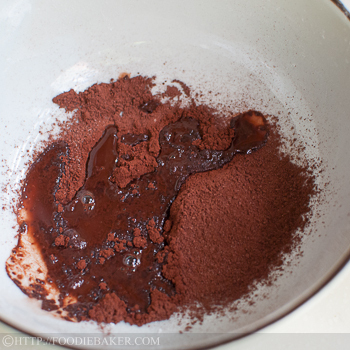 Combine cocoa powder and boiling water in a medium bowl until a paste is form. Set aside and let cool slightly. 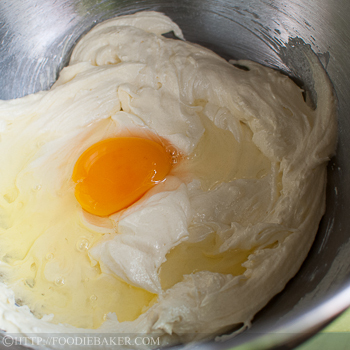 Place the butter and cream cheese in a large mixing bowl and beat with an electric mixer until creamy. 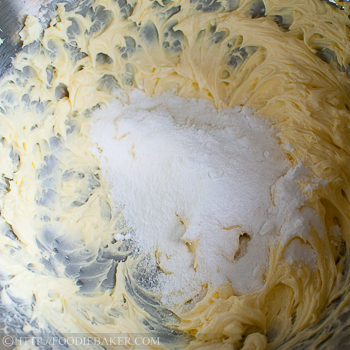 Add in the superfine sugar gradually and beat until the batter is light, pale and fluffy. Scrap down the sides occasionally. Beat in one egg until fully incorporated and scrape down the sides. Beat in the second egg and the vanilla until fully incorporated. 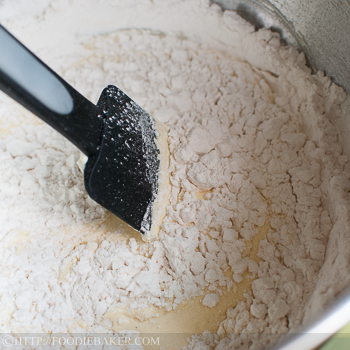 Sift in the flour mixture in 2 batches and fold with a large spatula until incorporated. 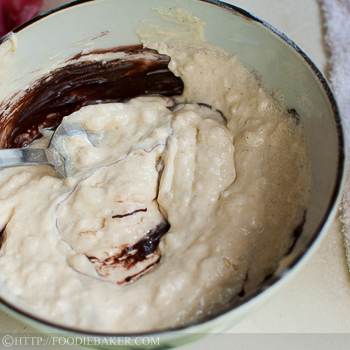 Mix ⅓ of the batter with the chocolate paste. Drop spoonfuls of the batter into the baking tin. 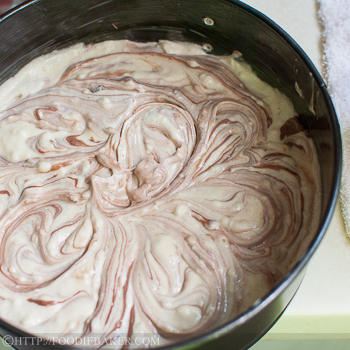 Run a knife / skewer in the batter to create the marbling. Bake the cake at 160 degrees Celsius for 20 to 25 minutes until a skewer inserted into the center comes out clean. Let the cake cool completely in the pan on a wire rack. Hi Doreen, yes this is definitely one of the perfect cake for tea! I like marble cake too. With the marbiling this cake look even more gorgeous. Hi Jasline, lovely pound cake. Love the texture and marble effect. YUMMY! Thank you Barbara! I guess turning on the oven has became a habit of ours! Thanks for choosing the recipe Lena! I’ve never seen rose flour in the baking shops before, where did you get yours? Thank you very much Mimi! Haha! Did he manage to taste the ginger?? Thank you Jeannie! I agree, I’ve been baking so much recently that I’ve got to find more guinea pigs testers to help me finish the bakes! I’m sure if your boys are chocoholics, they would love the cake even more! Thank you John. I try to keep my pantry ingredients as basic as possible as I am running out of space to store them! Glad you find the substitute useful. I wish I can cook as much like you, your recipes always look amazing, and I really want to try some of your brodo, can’t get it out of my mind ever since I read that post! Hi Joyce! Thank you 🙂 Butter cakes are so sinful but they’re really addictive. Thanks for choosing the recipe, hopefully can make it for the next bake! Thank you Sibella, you flatter me! Thank you Mich! Wish I could have done the marbling better! Aww thanks my friend! Take care! Hi Alice, can’t wait to see your cake! I love the swirl of your cake! 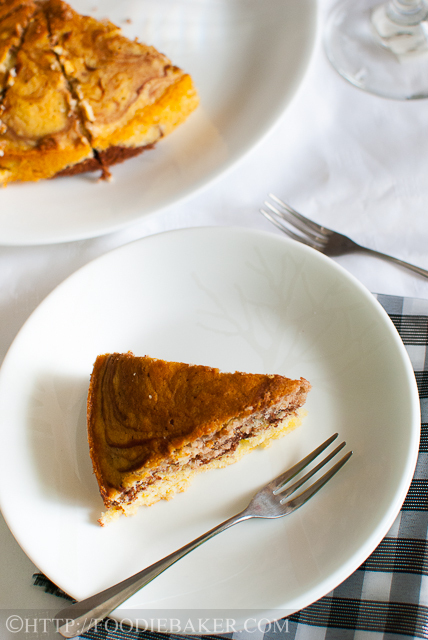 A wonderful twist by making it a marble cake! 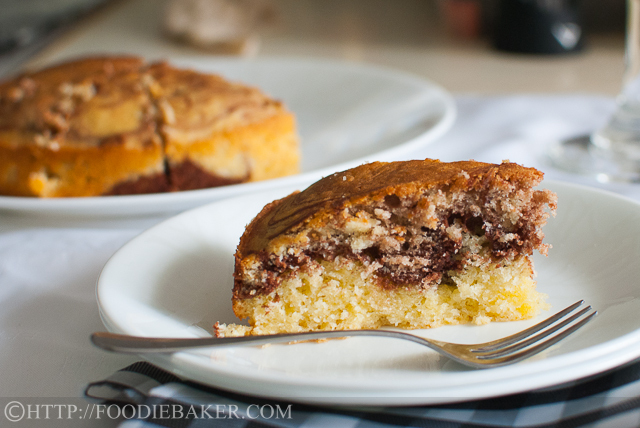 I cannot never resist a good marble cake! Your cake looks very good! A slice would be perfect with a cuppa coffee or even tea, I’m a sucker for both! I like the marbling, chocolate would make it even more delicious. Do like the addition of cocoa as otherwise this wouldn’t be my thing at all. Sounds yummy! When I know that I can bake this cake with cold oven, I didn’t hesitate at all to pre-heat the oven. I try to bake less especially if the temperature outside is more than 30 degrees! You must be very heat-tolerant when come to baking in Singapore… I remember sweating like crazy baking cake lapis and chinese new year cookies when I was living in Singapore… I find it hard believe that I was doing that… LOL! Your marble pound cake look gorgeous! Mine was a less crumbly and I’m guessing the extra crusty outside area in my bundt cakes seems to help holding the crumbs in place… me and my crazy cake analysis! A really gorgeous marble pound cake. It looks perfect to me! 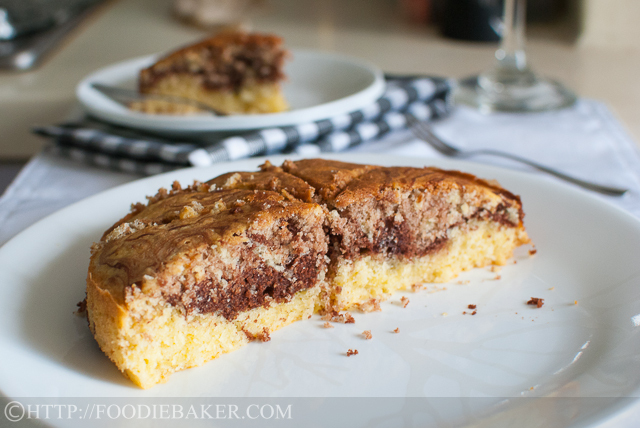 I love marble cake!